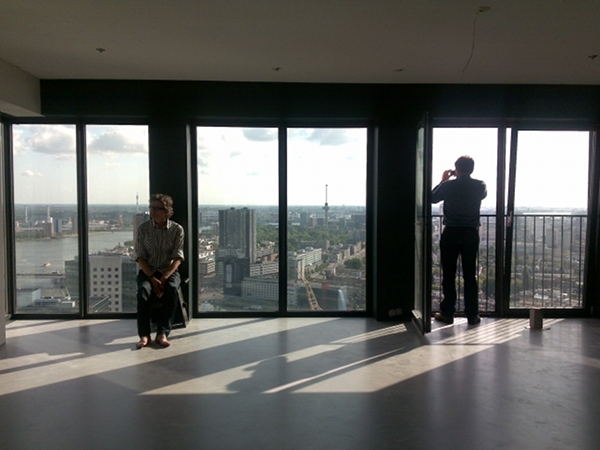 ART PRESENTATIONS ON THE 37TH FLOOR OF THE RED APPLE IN ROTTERDAM. VISITS BY APPOINTMENT ONLY OR JOIN GUEST LIST FOR AIRY OPENINGS. What criteria are used to select art that is presented? How can an artist share his or her vision? Should it be individual and visual presentations? How can we contribute to the discourse and stimulate the quality of art? How much does the art interfere with private life? Can art be created on the spot or how can visitors take active part in the presentation? Does the Gallery need to be professionalized and be financially independent? This entry was posted on 07/01/2009 at 10:30 and is filed under programme. You can follow any responses to this entry through the RSS 2.0 feed. You can leave a response, or trackback from your own site.